At some point along the way the gang realized they forgot to say thank you to coaches and volunteers. So, the gang is back in 2010, this time with Thanks to My Hockey Coach. And they also decided to help out other young hockey players across the entire world with Advice for a Young Hockey Player. Let's take a look at the latter title here. 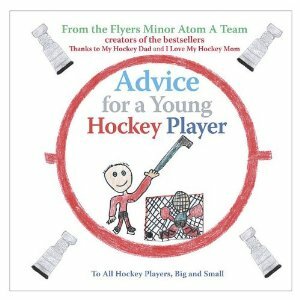 The bestselling little authors of Thanks to My Hockey Dad and I Love My Hockey Mom have been at it again, drawing on their cumulative hockey experience as nine-year-old player prodigies to create the next hockey bestseller: Advice for a Young Hockey Player. The colour illustrations throughout are creative, funny, and charming. There are 570,000 hockey players registered in Canada, and they would all benefit from this simple advice... as would their parents. Parents will enjoy the simple messages, and be gently reminded that hockey is a game, a game we all love, but a game that, most of all, we should let our kids play with joy, love, and passion. It is a game intended to be fun. Flyers Minor Atom A Team. They have successfully completed Grade 3, and look forward to the challenges and experiences that await them in Grade 4.